A mix of sugary pop songs sparsely arranged around sampled video game percussion, this debut full-length album from the Fayetteville-based bitpop act has garnered numerous awards and nominations locally, including \"Best Local Album of 2007.\"
David\'s Pegasus is a multimedia art project introducing audiences to a colorful fantasy world by way of fashion, music, and animation. A live band plays along to a silent animated film portraying the adventures of the love-able King David and Pegasus, his sassy winged traveling companion. The onscreen duo come from a nostalgic video game world inside the AtardoVision, an ancient and mind-numbing game console. Together they explore their universe, conversing with gods, collecting coins, escaping hell, and so on. The music of David\'s Pegasus sounds like the animation looks: colorful, bright, and catchy. To match the video game theme, songs are arranged using real samples and synth instruments from classic game and computer systems including the Commodore64 and NES. To this structure, live musicians perform with organic instruments and percussion, adding the essential human element. There is a sense of harmony between man and machine, player and computer, video and audio. While David\'s Pegasus is not technically a virtual band (the titular cartoon characters do not play music together), the animated feature is a substantial part of the group\'s performance. This approach is partly in tribute to the music and films of the silent era when audiences enjoyed live accompaniment to the on-screen action. David\'s Pegasus creator, Barry Brinegar describes the project as a \"movie with a band\" although the inverse could be argued, depending upon one\'s preference toward audio or video. The animation, characters, songs, and storyline were the creations of Barry Brinegar, who also performs/records guitar and vocals in the band. Project manager Bryan Brandon has played piano with the project since its first performance. He also manages his family\'s bakery, Ozark Natural Breads. Stuart Field and Paul Wolf joined the group in 2008, further developing the sound of the project. Stuart had been familiar with David\'s Pegasus since the bands earliest performances, occasionally sitting in with the band, and recording a series of demo songs which he intends release as a recorded narrative similar to Harry Nilsson\'s The Point. Besides playing drums with David\'s Pegasus, Stuart Field also keeps busy as the station manager at the University of Arkansas\' student-run radio station, KXUA 88.3FM, and performs his solo material regularly as Timber!, an underground dance sensation for teenagers. Paul Wolf, bassist, first played with David\'s Pegasus in late 2007 when his band, Woolly Mammoth, sat in as percussionists at a house show in Fayetteville. Besides playing with David\'s Pegasus and a handful of side projects, Paul works as a high-school teacher and cook. Krystal Brandon is the merchandise director who produces custom apparel and accessories. Her designs have represented the project at numerous art events and created brand recognition throughout the region. For special live action sequences, amateur actors lend their performances, most notably musician James Johnson who appears as the demented Hank MeGacock, a mad scientist who forces his patients to play marathon AtardoVision sessions. David\'s Pegasus performed their first set in Feb. 2006. During the course of that year, the project was performed locally around Northwest Arkansas, adding songs and cartoons to its repertoire. David\'s Pegasus-themed fashionsand cartoons have been featured at numerous Art-Amiss events. Members of David\'s Pegasus also performed at the 2006 Art-Amiss Halloween party, and even produced an entire Halloween-theme episode for a special costume party with Ft. Smith\'s An A+ Setup. By early 2007, the band had finished recording, mixing, and mastering their debut album, Choose the Game. They had shared the stage with many talented bands including: Mar, Tel Aviv, Fire Don\'t Care, An A+ Setup, Taught the Rabbits, Benjamin Del Shreve, The OneUps, Catfish Haven, Ill Ease, Timber!, 2 Dean Crew, Ginsu Wives and The Holy Ghost Children. The band was nominated for the Best Indie award at the 2007 NAMA\'s and performed a brief episode at the award ceremony. 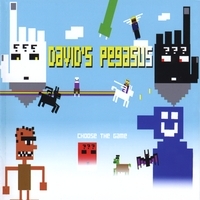 Choose the Game was produced and released in March, 2007. The debut album garnered critical acclaim from local media and independent record stores with David\'s Pegasus garnering further NAMA 2008 nominations, including Best Indie Band, Album of the Year, and Band of the Year. Long-running indie record store Sound Warehouse voted the debut \"Best Local Release of the Year\" and celebrated the announcement with an in-store concert in April, 2008. In May, the project performed new material on-stage at the Spring Art-Amiss event. The evening included a twenty-minute fashion show with music arranged/recorded by DP singer, Barry Brinegar. The band is currently touring regionally to promote the album, planning national and international tour dates to bring the project to new audiences, and releasing media via their new video podcast, 2-D A/V. David\'s Pegasus has performed at the following venues: George\'s Majestic Lounge, The Dickson Street Theater, Vino\'s, Juanita\'s, White Water Tavern, Easy Street Theater, the Gypsy, the Blu Room, The Music Hall (formerly Clunk Music Hall), the Pontiac Coffee House, The Delicious Basement, The New Deli, Botanical Gardens of the Ozarks, The Old Post Office, The Green Light-bulb, Sodie\'s, Studio A, the Boom Boom Room, Sound Pony (Tulsa, OK), the Tree House, and a variety of art/fashion parties in Fayetteville, Little Rock, and Ft. Smith, AR. Choose the Game was recorded at AtardiCorp Studios in Durham, AR. The album was mixed and mastered by Dwight Chalmers at Listen Laboratories in Fayetteville, AR.